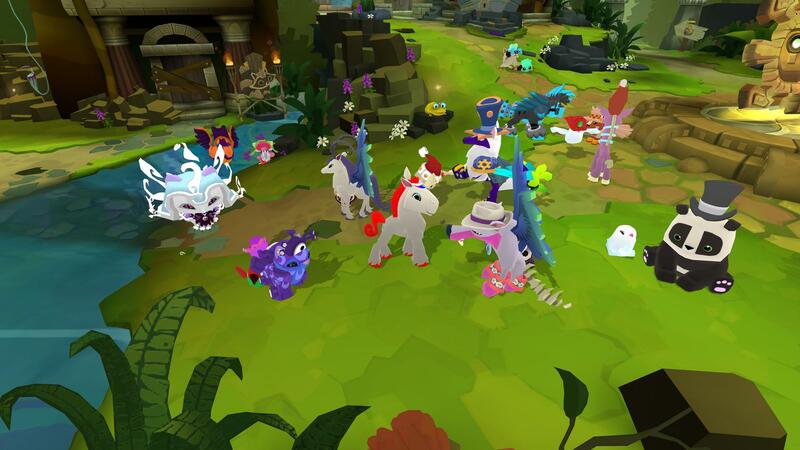 Animal Jam is a F2P Simulator MMO for browsers, developed by WildWorks & National Geographic. Animal Jam is a free to play online playground for children that love animals and like to have fun playing games whilst learning about the wild. Players are able to create their own animal characters, customise them, dress them up, build a den, adopt pets, play games and access a number of educational features. The game was created in partnership with National Geographic and by learning and playing users can acquire in game currency to buy lots of fun and useful items. The game is completely browser-based and does not require a client download to play. When stepping out into this wonderful world for the first time players are able to create their own character from a number of different animals, everything from rabbits, penguins, tigers, koalas and more. Naming your character couldn’t be easier with an extensive list of approved words that when combined together will give players unusual and humorous names that they can go by in the game. The first steps into the game will allow players to completely customise the look of their animal changing their colours, fur patterns and more to make them truly unique. The world is divided into a number of different environments, terrains and natural habitats of various animals in the world, but also has a fun and fantasy element with areas such as a city populated by animals that walk and talk, fun jungle areas with huge tube slides and other interactive elements. Players are able to visit the clothing store to buy all manner of accessories and clothing to dress up their animal character, spending the in game Gems currency, there is a wide selection of items available from moustaches, pirate eye patches, hats, jewellery, footwear and other creative apparel. Similarly players gain access to their own Den, their personal home that they can decorate with a wide selection of furniture and items that they can move around and arrange as they see fit. For those that don’t wish to travel the world alone they can make new friends from real-world players, become a subscription Member and gain access to member only parties and adventures, or even adopt their own virtual pets. As a Member players get access to all the available virtual pets, but there is a selection available to free to play accounts; players can purchase and customise their pets which will then follow them around the world on their journey. In the game there are mini games dotted around the world that can be played solo or with friends, everything from puzzle games where players must flip cards and find the matching pairs, an Angry Birds style game as well as many other challenging competitions. If successful in the game players can acquire more Gems to spend throughout the world, however many items are inaccessible to non-Member players, which does require a subscription but gives access to a larger number of benefits such as unrestricted animals, pets, den accessories and a weekly Diamond gift. Animal Jam is more than a fun children’s game, it is extremely educational and throughout the world mixed in among the games and fun features are a variety of learning tools where players can watch videos on different wild animals and learn all manner of facts and important information about natural sciences. Dotted around the game is a selection of print outs for children to continue the learning and fun even when not in the game. Child safety is extremely important within the game, emphasised initially by the limitations on character names to ensure there are no rude or offensive character names running around the world. The in game chat, whilst public, is heavily restricted with a word filter and some words cannot be typed out in order to protect children. At character creation children are asked to enter the email of their parents should there be any problems and are encouraged in game to follow certain rules and prompt players to report any bad behaviour that they witness. There is even a multiple choice quiz that you can find in game that asks children many questions such as how to deal with someone being mean to another player, or players asking for personal information such as phone numbers and addresses; players earn more gems the more right answers they get and so can keep playing the “quiz” so that the answers are remembered.